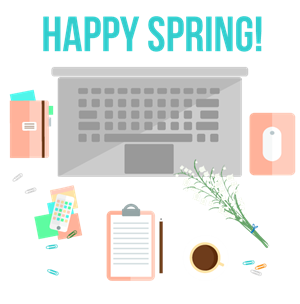 Celebrate spring by organizing your office. De-cluttering and refreshing your workspace improves motivation and efficiency. Take a minute to check out your office for “curb appeal.” Does it say, "A professional accomplishes things here"? If not, follow these steps to solve the problem. See which pens work and which are taking up drawer space. Also, ditch bent paper clips, loose staples, etc. Return borrowed items with a polite "Thank you." Pitch outdated menus and offers. They’re unnecessary and probably available online. Get rid of that withering plant and the deflated birthday balloon. Are items you use most often within easy reach? Store items by whether they are used daily, weekly or rarely. Is your inbox a collection point that never gets touched? Is so, why does it own such valuable desktop real estate? Does your corkboard display this week's schedule or yellowed news clippings and an expired coupon for a car wash? What's with the wool scarf dangling on the coat rack? Your office should be current. Keep a cleaning kit with screen wipes, antibacterial wipes, a microfiber cloth, and a can of compressed gas.